Thank you for your interest in the “Power Words! 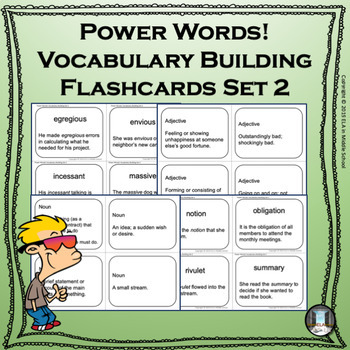 Vocabulary Building Flashcards Set 2”! We are confident that you will be extremely pleased with these review cards for your student scholars to use! 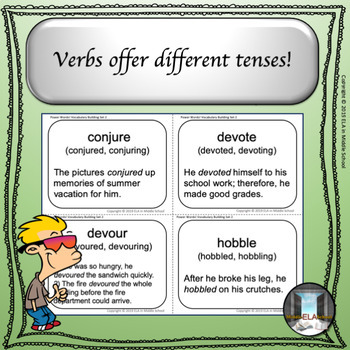 This product can also be used as a stand-alone set for vocabulary building! We recommend that you print these cards on 6 sheets of card stock, which you can then cut apart and laminate for a strong, long lasting, resource. When you print double sided from the templates, four key words, along with sample sentences using each word as examples, will be on the front of the sheet, and the parts of speech and definitions will appear on the reverse side aligned with the correct word. 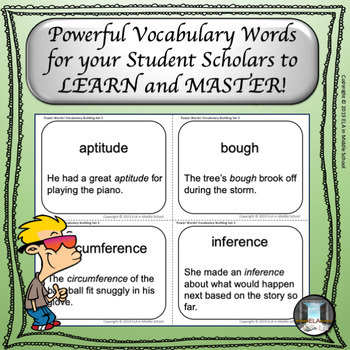 Please keep watch for new flashcard sets in this series that are currently being created and will soon start appearing on the ELA in Middle School TpT Store! This lesson is appropriate for grades 4-8. Go to your “My Purchases” page and click on “Provide Feedback” button. Your feedback is greatly appreciated! Click https://www.teacherspayteachers.com/Tptcredits for more information. Become a follower to receive updates about new products as we add them.